Something I've wanted to do for a long time. Finally decided to be unlazy enough to make it, and I may even finish this guide! I wanted a build where we literally don't have to lift a finger; just run past mobs and watch them die. That's exactly what this is. Not the fastest, but certainly not slow! <Blessed Life> - max. Free %dr and flat dr? yes plz. Get all you can! <Superbeast> - max. Insane free spell damage? yes plz. get all you can! <Tainted Blood> - max. Huge defense, poison res, and regen. max it! <Stormlord> - max. Huge stat boost. We don't need to worry about putting points in str or dex to wear gear. excellent boost to our life and spell damage. <Vessel of Retribution> - 20. One of our main damage sources. endgame I put 20 points into it and I hit the damage cap. <Rapture> - 3. Could be one pointer but I don't like having to refresh every 30 seconds. 3 pts gets us 70 seconds. <Hoplite> - 1. Excellent tanks. <Sacred Armor> - 1. One of the goals of this build was to make something that could rush ubers early WITHOUT using SA cheese. 1 pt just for ez body recovery. The only reason we use this shield is for the elemental absorb.
. T1 is good enough but t2 will save us a crystal. We're going to be using these pieces for a while XD These items will carry you through the end of Act 1. As you go, make sure to pick up all runes and apples you find. We're gonna need some gold at the beginning of A2. Also, on your way to Andariel, put 3 points in Rapture. Keep VoR and TB maxed, putting the rest of your points in Terror Strike/Solstice and Equinox. When you get to Act 3 it's time to start making at least armor/belt (and we might as well get some decent rings/amu as well). What will we use? We have choices! is a great choice simply for the bloodlust proc. Nothing else is really useful to us, but the def is nice. Other option is honorific, with flat dr and phys/magic spell damage. Only real option here is honorific. 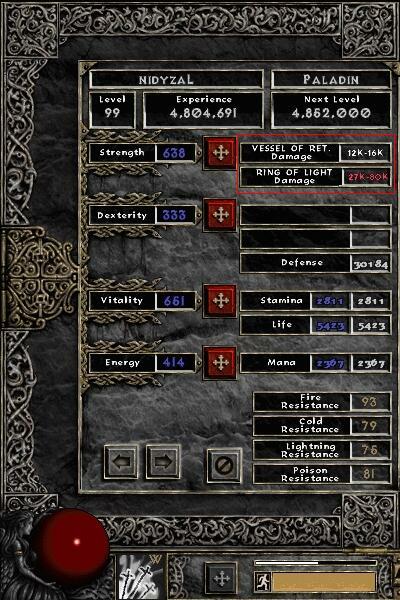 MO phys/mag spell damage and flat DR.
We need 10% spell damage lucky upgrade on rings and at least +2 skills on Amulet (1/2 from natural affixes and +1 from lucky oil). Rest of the stats don't matter so much. To get high enough ilvl on amulet for +1/2 skills to spawn, use the dragon reroll recipe if you're <lvl 30. I was lvl 26 at this point. To kill the dragon just run close circles around him and run away when you need to heal. Even with t3s, we can breeze through Act 4. Just keep uptiering if you like or rush it! First things first, get your resistances back to 75%. Now that that's taken care of, we're free to run through act 1. Pick up any perfect onyx/turquoise/bloodstone/amber you find along the way. We're going to use them as socket fillers to help us get 95% all res. Prioritize fire and poison for now. We can do the two minigames in act 1 as soon as we come to them. You'll need an eth and thul rune. Be keeping any flawless/perfect emeralds you find from now on. RW. You can find higher runes running Hatred Nihlathak. You can do sewers now or later if you want. It'll be a little slow at this point. Totally doable, but it will be faster to do it later and we don't really need the extra skillpoint at the moment. You can do LC2 when you come to it or wait until later when it will be faster. Basically you just want to summon them, run away, then lure them 1 by 1 and kill. Duriel is a breeze. Act 3 is the first time we'll face a bit of difficulty. Overall it's pretty easy, but the poison damage here can wreck us, especially from peace warders on the way to Mephisto. Grab some rare rings and dragon roll them to get them to ilvl 80. You want to roll +1 skills and 20%+ phys/magic damage. Whether you get that from natural roll or lucky upgrade it doesn't matter. You can farm some perfect turquoise to raise your max poison resist to 95% or you can just play a bit more carefully. It's up to you. We still only have the one damage source so it's easy to be overwhelmed by large packs. Just run in circles around/near them and you should be fine. In durance of Hate, stun + Peace Warders = dead. If you get stunned, retreat to a safe area and wait it out. When near Peace Warders, DON'T stand still. Don't rush into big packs. Ulfhedin, Heretic, and Peace Warder are the enemies you have to watch out for. If you can run past them, do it. If you have to fight them, try to take them 1 by 1. Use your summons to lure/distract. Drive Mephisto into a corner and distract with summons. If he's facing you, reposition since he might target you. Should be a pretty easy fight. to rare pally shield with ring of light. With the suggested gear i hit 13-40k fire dps without terror strike activated. Nice! now we can wreck Diablo. Spam a few before he's summoned and he instadies. Rush through Act 5. Watch out for Detonators because even at 95% fire res they can kill us. Everything should die fast to Ring of Light and VoR. Madawc will kill you fast so save him for last and cheese him with SA. We're not above it Baal dies in a couple seconds to Ring of Light. I'm not making a destruction guide because the gear we have now is what we'll be using for pretty much all of it. I will recommend gear upgrades as we complete ubers. Get max res. You know the drill by now. Take some time to remake your honorific belt and boots, you can get max res and -30 efr on both. put some more efr on rings/amu and you're at -99. Head to the Black Marsh and we'll do the Butcher! ezpz. We have a lot of reanimates. You may want to use RIP recipe on a piece of gear to stop them. We want mobs to walk towards us so they die in our overwhelming field of pain and death. MO fhr on your honorifics until you hit max fhr. If you have any questions about the early/midgame gear used for the early ubers, refer to the hatred/terror leveling sections. Let him hit summons, move him to circle, kill. Distract with summons, burn with RoL. Summon in corner, run away. if you can, lure him away from his minions. Otherwise just lure them in small groups and kill. Pretty easy. precast and summon. Run. DON'T get hit. That's it! Now is as good a time as any to unlock your BRC skill if you haven't already. Easy enough, just walk forward and spam RoL. VERY easy. we can pretty much faceroll this place. Get yourself 666666 gold and complete the last trial, buy your 4 hearts and cube with cc! Max Blessed Life, Superbeast, VoR, Solstice and Equinox, TB, and Stormlord. 1pt Divine Apparition, rest in Terror Strike.
. Also, we're going to try to get Judgement Day charm as fast as possible and then move on to farming Toraja for Auhe rune. May take a couple tries to get right. Typhoon sentry will get us in fhr lock if we let it hit, crystal ball may teleport, etc. That's the only reason it's orange rather than green. Later on this is supergreen. Pretty simple. Kill stuff, then kill avatars. don't get hit by punishers or lantern archons. If you like you can just keep killing the first one over and over rather than running the whole level. precast, summon, run around and keep casting RoL. Keep summons up. If they die go back up and resummon, then come back down. Pretty easy. summon in the hallway so that they have to walk over your RoL to get out. Should make short work of them. Get close to totems and burn them down! Use summons to distract skellies. If a totem is almost down and you're out of position/crowded with skellies, with a full life orb you can tele on the totem and whack it with terror strike. 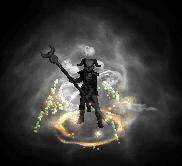 If you put celerity proc on your weapon you don't need to worry about the slow from miasma. If you get slowed just whack anything near you a couple times and run away. Get some lolsummon on one of your rings and make Ix pally helm runeword (Crusade - item tag doesn't work!) with at least +10 to Eagle Stance. Summon and keep your OPlites up and spam more lolsummons whenever they all die. When one of the bosses spawns rush over to him and RoL. We can tank pretty well so we don't need to worry about anything other than taking him down fast. Getting the charm is easy, getting both bosses down within 30 seconds of each other is just luck. We don't need to get the upgrade right away, we're ready for Toraja after this. Keep edyrem up, telestomp heads. We're gonna stick around here until we find an Auhe rune. Shouldn't take too long*. in a plated belt. MO with ED before making RW. Reroll until you get +19 to path of flames. Roll some new rings and amu. 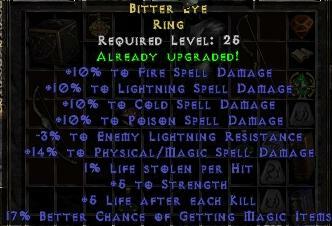 On rings you're looking for +1skill, -20efr, and +30fire/phys/mag spell damage + lucky upgrade ofc. MO with -fire res. Get Jday upgrade now if you didn't already. You'll notice that Path of Flames kills a littler slower than RoL so if that's a problem you can still use RoL. When all that's done you should probably respec. We've gotten a few +max skills items so we should make use of them! Same as before except we won't have any leftover points to put in terror strike, instead we'll put all leftovers into stormlord after maxing the rest of our skills. As we near endgame we'll easily hit damage cap on VoR and can start taking points of out it and solstice and equinox and putting them back into Stormlord and then Terror Strike. Go ahead and get all 3 skill signets if you haven't. Gather the 5 Veteran eyes and cube with your class charm. Kill Destruction Baal so we can access cows. Prioritize getting Hivemind at this point if you don't have it already. The next items we need will be the pieces of the neutral pally set I mentioned earlier. Summon him about a screen away to the left of the wall you intend to fight by. When he's up run over to the wall. He should teleport with you in between him and the wall. then just whack him until he's dead. Put losim on your weapon and you don't need pots. Circle around small groups of mobs. retreat to heal if necessary. Try to lure lucion out of the area he spawns in. If it's too crowded lure minions out of range of his immunity aura and clear a bit. Clear minions around him and lure rats away. It's actually better if you don't use summons. Telestomp his head and whack him until he's dead or use RoL. Sometimes you'll get screwed by 100 necromorbs hitting you at once after you teleport over a wall. just make a tp as soon as you port over, then if you have space to run around, run around and let things die. Otherwise go back to town to avoid barrels. SA and re-enter to clear mobs until you have space to move. I didn't include full run as the file sizes get ridiculous pretty quickly when recording, so I show how to survive teleporting over walls and how to clear big rooms. should be enough I guess I didn't record assur kill but I'll include one in showcase videos at the end. You should start trying to get ahold of a shamanka now. Until then you can use whatever bloodlust proc item you have access to. Very easy. Use summons to lure packs and then run up and whack them. teleport on dragon's head and enjoy as fiery justice smites your foe. Just keep moving! When MCS is clear enough, run up to it and whack it, then hit it with purify. You don't need to apply OW, meleeing it first just helps to ensure there's nothing in between us and it Grab charm and get out of there. Enemies take a little too long to die for us to feel totally comfortable here at this point. , and a nice defense chest. There are quite a few options here, some of which i have listed in the endgame gear section. Grab yourself a sacred Long War Bow. We're gonna roll a tantrum bow. IT DOESN'T HAVE TO BE A GOOD ONE. Use Whatever shrine you want to craft, it doesn't REALLY matter. Abandoned is best since our dex is low at this point, second best is Weird for damage, nothing else is really serves our purpose. We need this bow for Kabraxis and Baal in Yshari Sanctum, as well as a few other odd situations here and there. for elemental absorb. As you can see, not the fastest fight. Just get one for now. We can come back and farm when we get our damage way way up. You can use a shadow avatar amulet if you like but since we haven't focused on -cold res, it's really not that important. Just a little something extra. At this point in the game, we've pretty much accomplished the original goal, which is to build something that can farm dunc without lifting a finger. We can start focusing on getting endgame gear so we can roflstomp fauzt as well. We'll do fine with the charms we have at this point but from here on I'm going to offer solutions using the cheapest/most available gear possible while maintaining the 'lazy" style. Gear switching will occur. Respecs will hopefully not, excluding bosses like laz/witch that [may] require a dedicated spec. We can switch back to set items here. Just max fire/pois res. We can use Hailstorm oskill from a rare amulet here since the rooms and corridors are so small that as long as he stays in one room, he'll pretty much always be under hailstorm. May take some time as he doesn't like to drops resistances that often, but fairly easy. Again, this goes faster if we respec to mindflay, but we're too lazy for that, right? Ben- pointed out that 4x Earth RW boots would be helpful for phase bomb when struck proc. Use 'em if you got 'em! Pretty easy. Only part that may give you trouble is the bridge. Don't be afraid to retreat to town to heal and try not to get hit by darkwardens. Very easy. We can pretty much stroll right through. I used krys gloves to slow meph but it's really not necessary. Can be done the same way with no slow. For Baal an "Amok" RW bow would be better than crafted tantrum bow due to LOS but I already had crafted so I used it. There are a couple places that require a bit of care: Mephisto's veil kings can 1-shot you, on-death proc from chimaeras can 1-shot you, and polar worms will die if you're anywhere close to them and lag the hell out of the game (though you probably won't die). As you can see in the video around 2:09, when i got to Andy right before I was about to go kill her a window popped up and by the time i got it out of the way she was dead XD. Grab yourself a 6x fire rune body armor (nealn pointed out that we can also just roll a rare/crafted body armor with the ctc tele mod for a cheaper option ). we'll need the ctc tele when damaged. other than that, you'll need tantrum bow to deal with bone prisons. I'm using ort xis bow, but regular ort or crafted tantrum will do just fine. Elementals are pretty self-explanatory. This one's hard just because we have to be very careful with how we move and we have to aim at the same time. I'm not even going to suggest a "lazy" way. just respec to mindflay and get as much lightning damage as you can. the faster this is over with, the better. Lure rats to the outer two areas and fight him in the middle two. Just keep moving and luring him away from totems, clearing when there's nowhere safe to fight him. The totems have a range of about 1 screen, so it's pretty easy to move him. *NOTE* - Be sure you don't have any passive damage sources like VoR/path/SoD on when you roll boss map as they will kill the invisible totem in the middle of the map that spawns the bosses! Aside from the final boss fight, the only hard parts are running through Pride's teleport maze and getting the right positioning for Wrath. 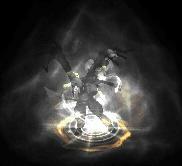 For final boss fight, you want to get Mendeln to where he's 1 hit from dead. Keep in mind that he does slowly take damage over time even if not getting shot by Rathma's bolts, so don't let him get TOO low before you "park" him in the corner. Once he's 1 hit away you want to move him away from Rathma and KEEP HIM AWAY from rathma. you can use summons or your own body to move him. Mendeln will run from things and cast SA if he's surrounded. Rathma will walk somewhat randomly but generally towards the player or closest enemy. We're going to summon ghosts and use them to kill Rathma. This is very dangerous as they will reduce our hp to 1 constantly, but it's the fastest way to do it. There is nothing here that is not awesome for us. Yet another awesome choice, and we can use a shield! Still probably the best choice, unless you want more damage for some reason. Everything here is awesome. We need the -enemy res and max res most of all. Some skills, %strength bonus, and a whopping 15% dr and 150 flat dr. Awesome choice for us. This is our goto high-defense armor. Strengh and vit bonus BOTH are awesome. Huge %dr and some tcd. is also an excellent choice. 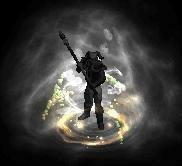 and will give us some flat elemental absorb which will pair nicely with our maxed res and %ele absorb. offer us huge life and defense. Pally skills, -poison and fire res, and hive oskill are what make this item shine. Hive adds 25% of our base vitality to energy, increasing our spell damage as well as giving us a nice passive wide-area poison skill. It's really the only option for this build. Strength factor to spell damage, skills, spell damage, strength. This is the goto endgame caster item for almost all caster builds. Best caster boots. ez choice. Alternately, you can use quiet/fascinating crafted boots. Gives us Path of Flames oskill and has nice fire spell damage. Only option here. A good roll on poison + fire spell damage + strength + vit + lucky oil upgrade makes for a very nice amulet if you don't need -resistances that badly. If you get lucky this is the amulet to use. Otherwise, a rare +4/5 skill +/- fire amulet will do just fine. +life, stats, or flat dr are nice bonuses. If you don't have any of these a rare ring with +1 all skills, +/- fire or phys/magic damage works fine. Sockets/Jewels:Same as above. We really only need max res gems. If we get max res from other sources, we have a lot of freedom as far as what we can put in here. Personal preference. Edited by evil_potato 1 year. GG Potato. Makes me wanna steal your build for reset. Beginner friendly and can do it all, it seems. For shield, if you're just worried about absorb, wouldn't Event Horizon be better? I can't remember the exact stats, but doesn't it roll 20-25 rainbow absorb? Really thorough, the best guide ever. Just what I'm looking for, Lazy build Haven't try but I will soon . Good work! I might be noobly, but what is RoL? Goodkidscc wrote: I might be noobly, but what is RoL? LHawkins1 wrote: GG Potato. Makes me wanna steal your build for reset. Beginner friendly and can do it all, it seems. yeah, but it's flat absorb rather than % absorb. yes. video recording is not my specialty. Was worst part of making the guide XD. Where do I get a source of Ring Of Light?